From: Cultural Dissent, Green Left Weekly issue #818 18 November 2009. Ever wondered what happened to billboard graffiti artists BUGA-UP? Want the low-down on the Chaser’s APEC stunt or an insight into Australia’s convict revolts? 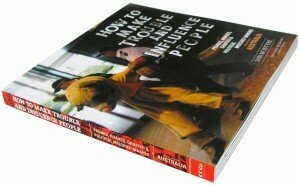 If so, How to Make Trouble and Influence People is the book for you. In his perfect book for enlightened coffee tables, author Iain McIntyre reveals the vital history of creative resistance in Australia through tales of Indigenous resistance, convict escapes, picket-line hi-jinks, student occupations, creative direct action, media pranks, urban interventions, squatting, blockades, banner drops, street theatre and billboard liberation. Included are stories and anecdotes, interviews with pranksters and troublemakers, and over 300 spectacular photos. McIntyre is a Melbourne-based writer and community radio broadcaster. He began his ratbag ways in the late 1980s in anti-racist and environment movements. How to Make Trouble explores the political mischief-making of anti-apartheid campaigner Meredith Burgmann, John Safran, “No War” Opera House decorator Dave Burgess and political artist Deborah Kelly. McIntyre interviews The Chaser on its great APEC hoax and gleans wisdom from the women behind the John Howard Ladies’ Auxiliary Fan Club. Kevin Buzzacott is an Arabunna Elder who played a key role in the campaign against the South Australian “Water Thieves” Olympic Dam mine. His humble interview about imaginative actions taken, from serving eviction notices on Western Mining Corporation through to engaging in thousand-mile long peace walks, is an inspiration. Grevillea was a “creative inspiration group” that took action against torture in Chile. Alan Bond, who owned most of Perth when Grevillea was active, was supporting the Chilean dictator Augusto Pinochet by buying into the Chilean telephone exchange. She was escorted out, but the point was made. McIntyre interviews the Graffiti Games Organising Committee; Stuart Highway, leader of the Network Against Prohibition, campaigning against the “war on drugs”; the gay male order of nuns – the Order of Perpetual Indulgence; and NoToPope Coalition activists. Interspersed between interviews and vivid photos of inventive actions are brief notes of historical resistance. For example — in Adelaide in 1970, an annual Miss Fresher beauty contest at Adelaide university was shut down when 60 feminists and their male supporters occupied the catwalk. In Sydney in 1798, an Irish convict was given 100 lashes at Toongabbie for throwing down his hoe and giving three cheers for liberty. In Melbourne in 1992, racist “Asians Out” graffiti was revised to read: “Take Asians Out to Dinner — No Borders” and “Asians Shout Death to Racists”.